...and there you have it! is a collection of Murphy's best Banjo Newsletter columns from 1983-1994. 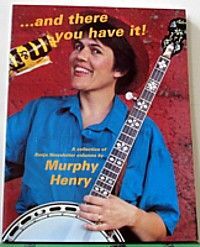 This 184-page soft cover book is, first and foremost, full of Murphy's advice about playing the banjo. But it also contains stories about her kids and their adventures while learning to play, stories about women in bluegrass, and stories about Murphy's travels through the years and some of the people she has met. The book has over 25 black and white photos, including a very pregnant Murphy posing belly-to-belly with one of her favorite banjo pickers, Jim Fee. The color photo on the cover was taken by the very talented photographer MaryE Yeomans and shows Murphy with two of her favorite things: her banjo and a bag of M and M's! If you have enjoyed Murphy's writing in Banjo Newsletter over the years, if you like her the work she does for Bluegrass Unlimited in the General Store column, or if you just like good writing with a down-home touch, you will enjoy this book. Sorry, but exorbitant postage costs prohibit us from shipping outside the US. If you are non-US and desperately want the book, please call us at 800-227-2357 and we can quote you the price plus shipping.